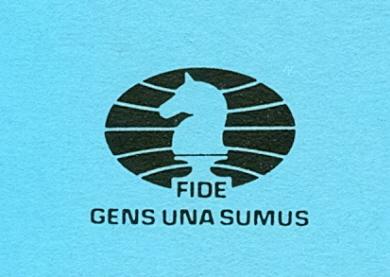 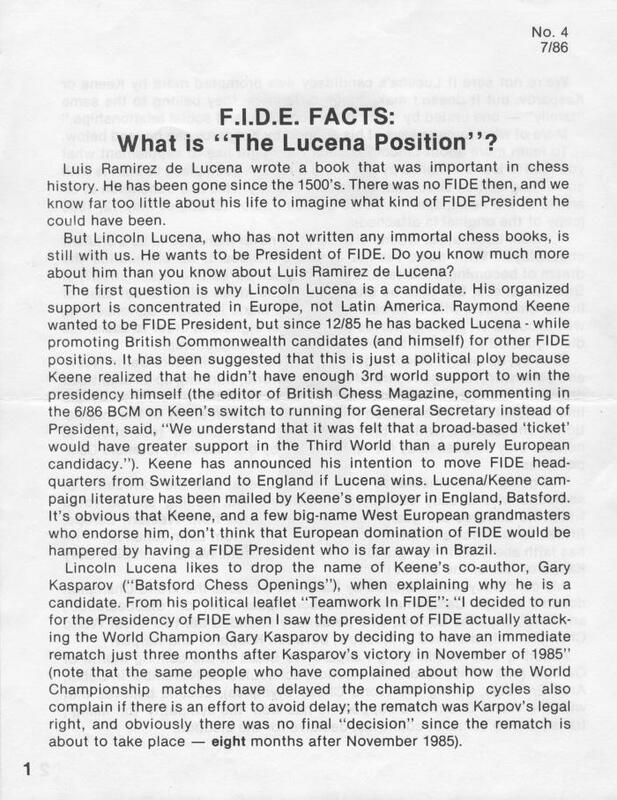 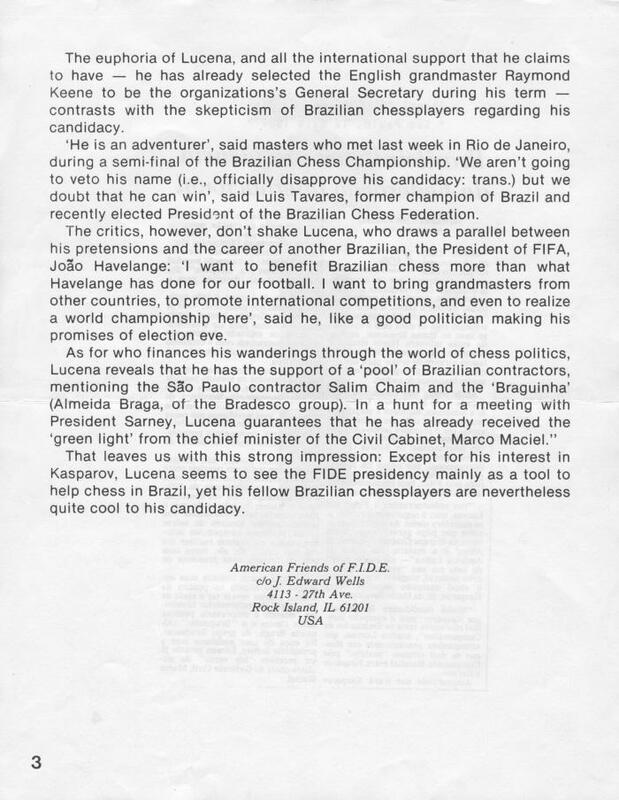 In the 1986 FIDE Presidential Election the incumbent, Florencio Campomanes, was challenged by a ticket comprising Lincoln Lucena and Raymond Keene. 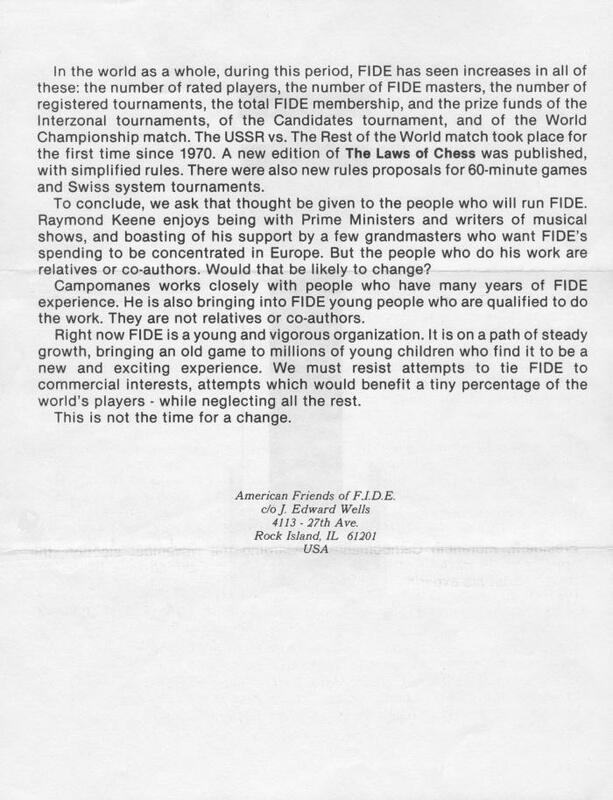 Voting was due to take place at the FIDE General Assembly’s session in Dubai in November 1986. 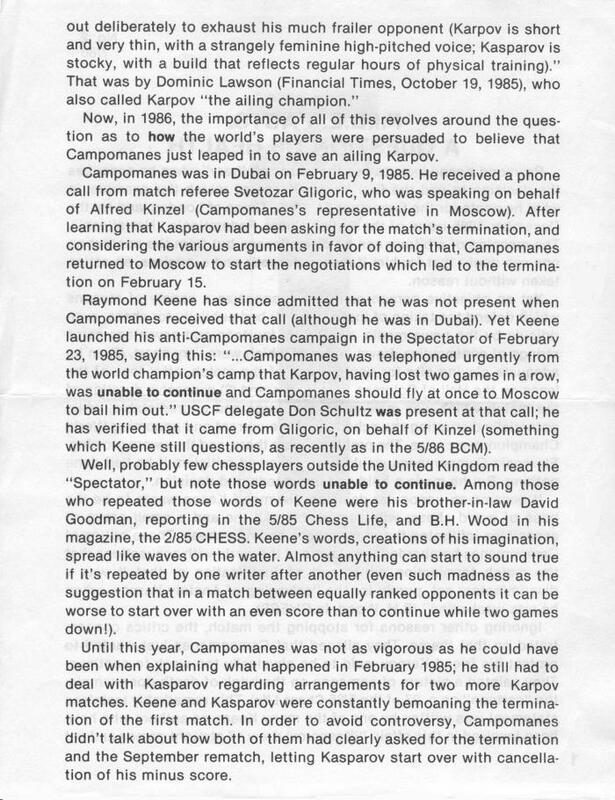 Campomanes’s decision in February 1985 to terminate the world chess championship match between Karpov and Kasparov after 48 games had prompted much press criticism, but to what extent had it weakened him? 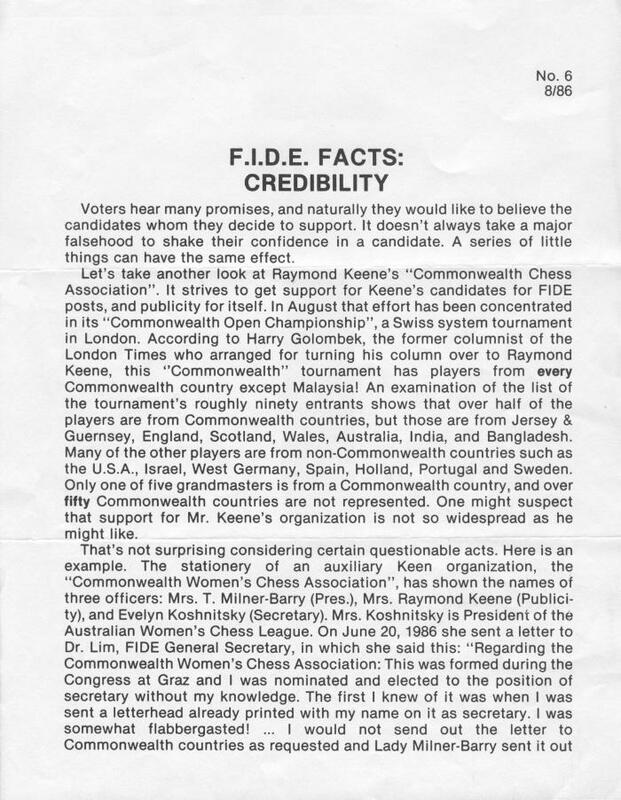 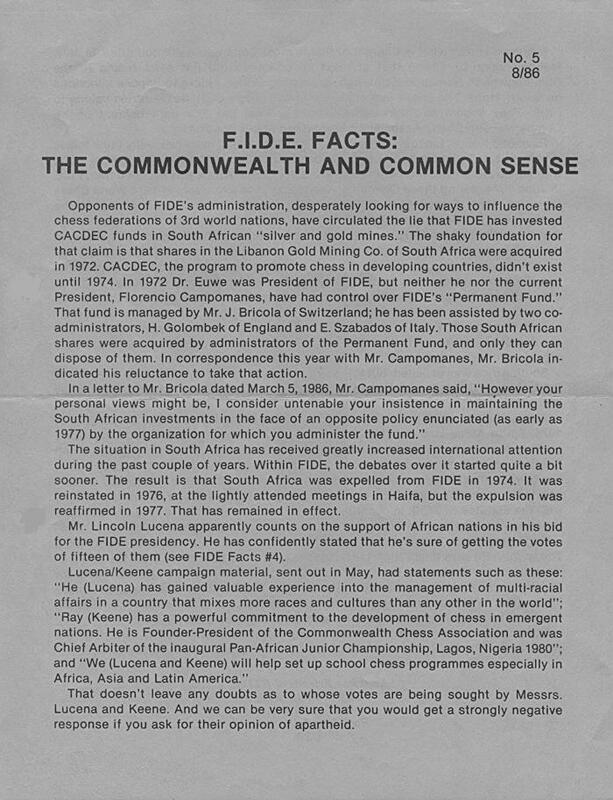 In July 1986 there appeared the first of a series of ten FIDE Facts sheets which played an important, and possibly decisive, role in the outcome of the election. 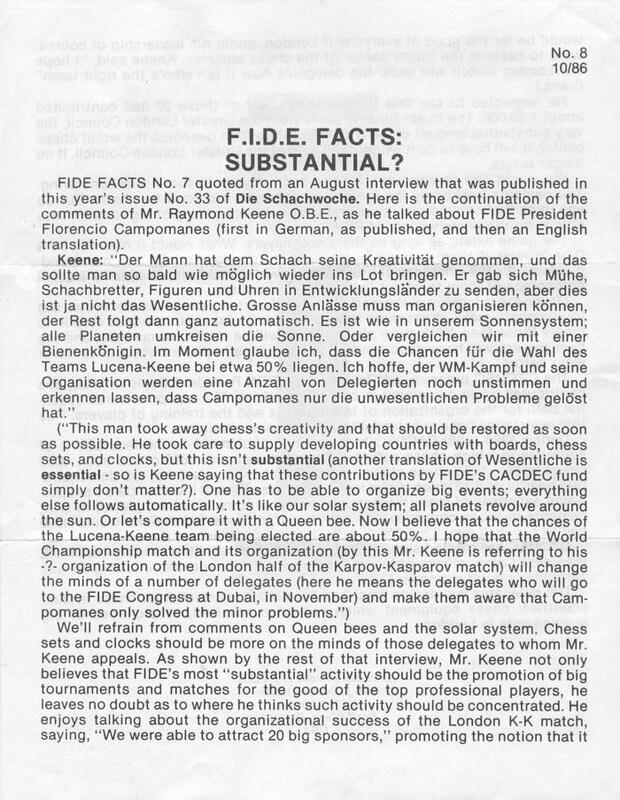 They were distributed principally to national federations but also gave rise to some wider discussion. 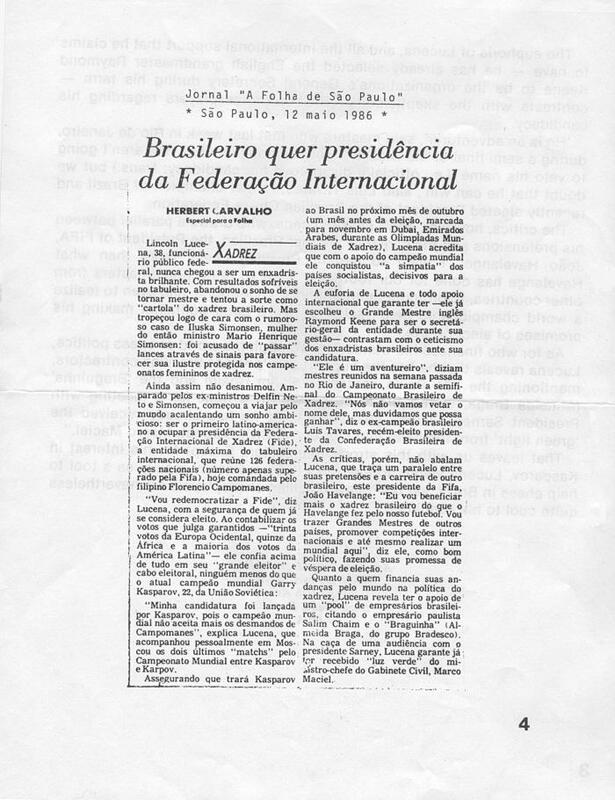 The full texts of all ten documents are given, without comment, in the present article. 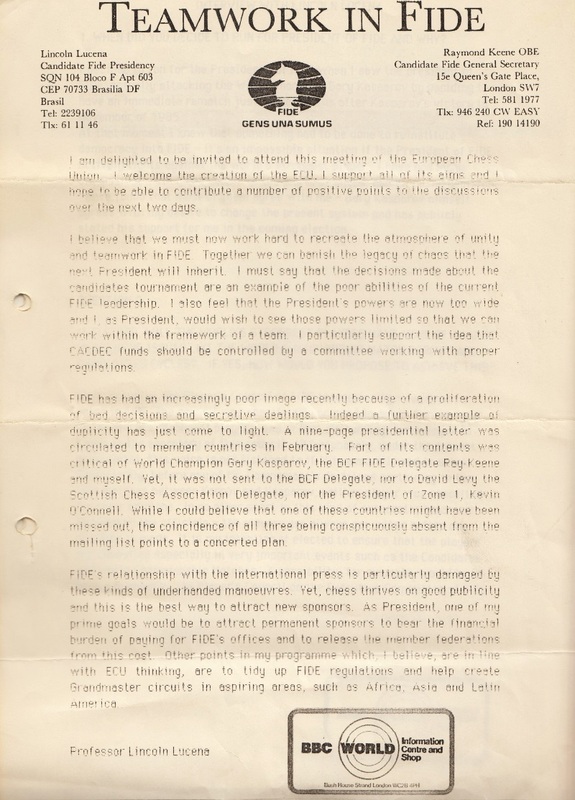 Now we are obliged to turn, without fear or favour, to the BCM. 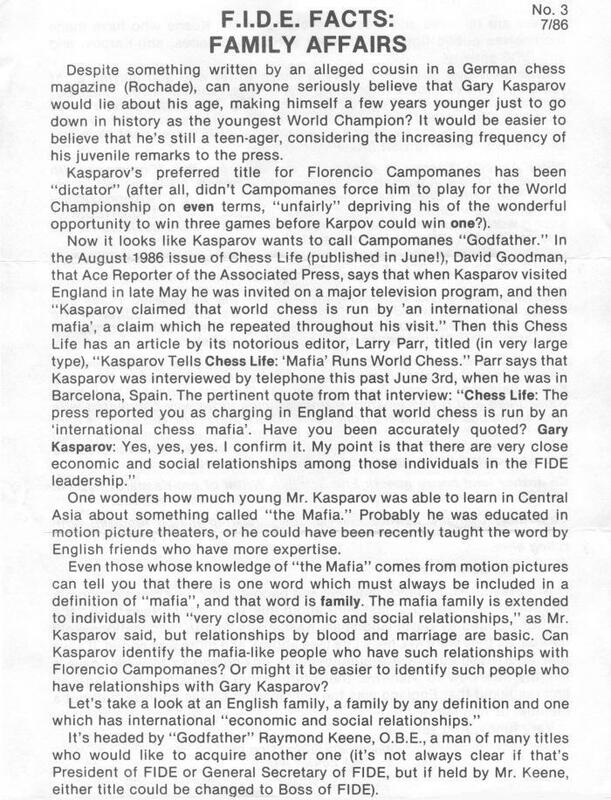 It will be recalled that paragraph c) of our 8 May letter to Mr Cafferty (which we published in full in C.N. 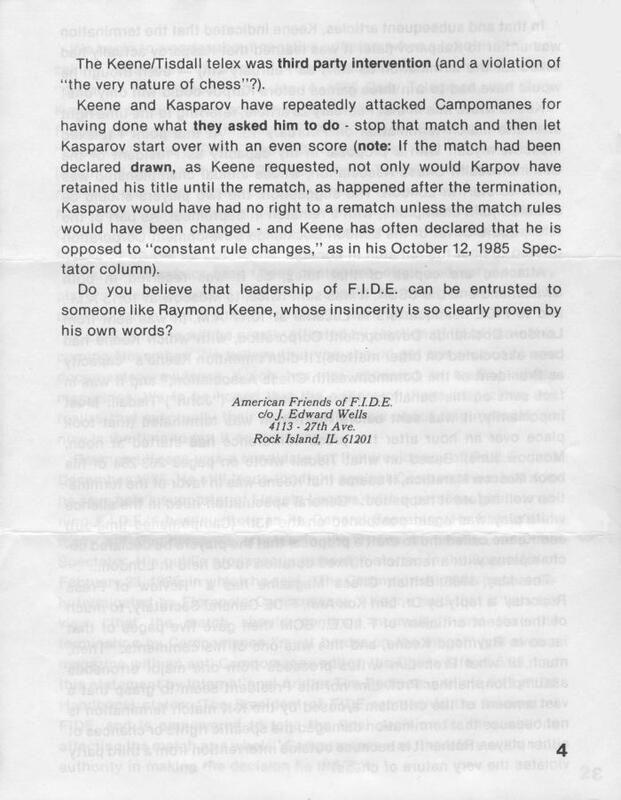 1222) pointed out another indisputable contradiction by Mr Keene (about return matches). 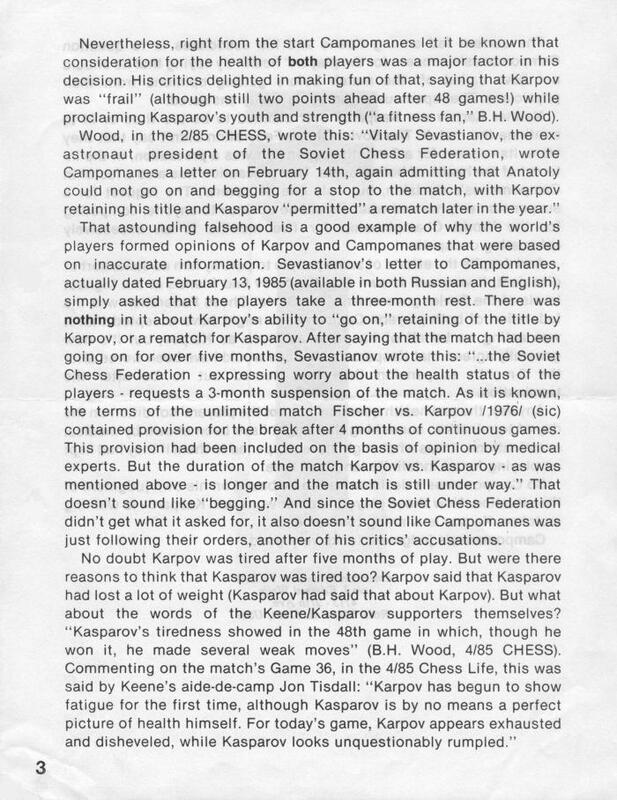 That too was edited out (June BCM, page 257). 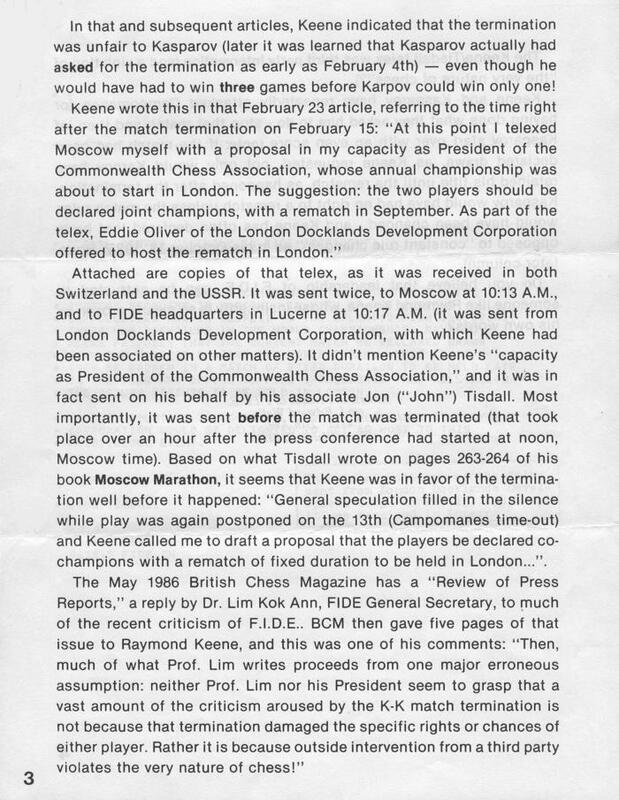 i) Page 176 refers to the ‘FIDE Pagination Affair’, and in the following issue so does Mr Keene (page 208). 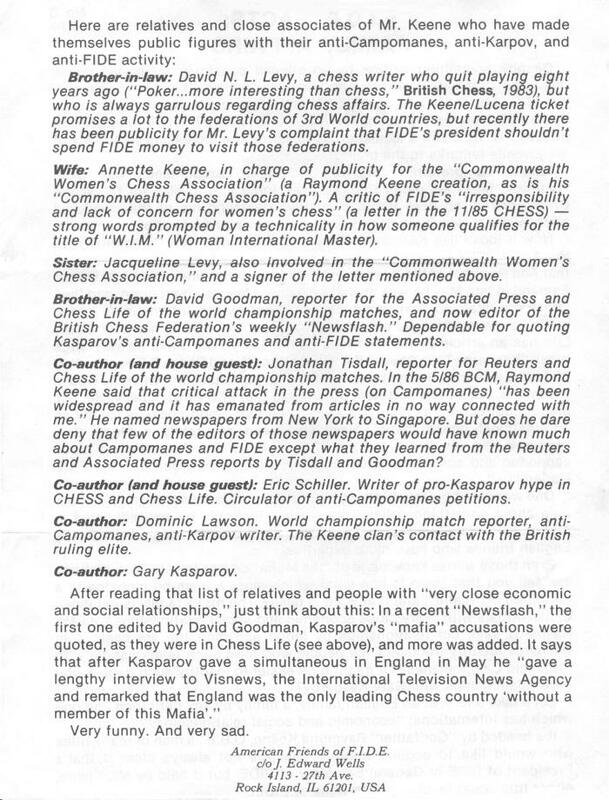 That is fine, but in that same (May) BCM the Editor reverts to the matter no fewer than three more times: page 177, page 189 and page 195.
ii) Page 225 refers to (and page 235 quotes) some ‘unparliamentary language’ by FIDE about Mr Keene. 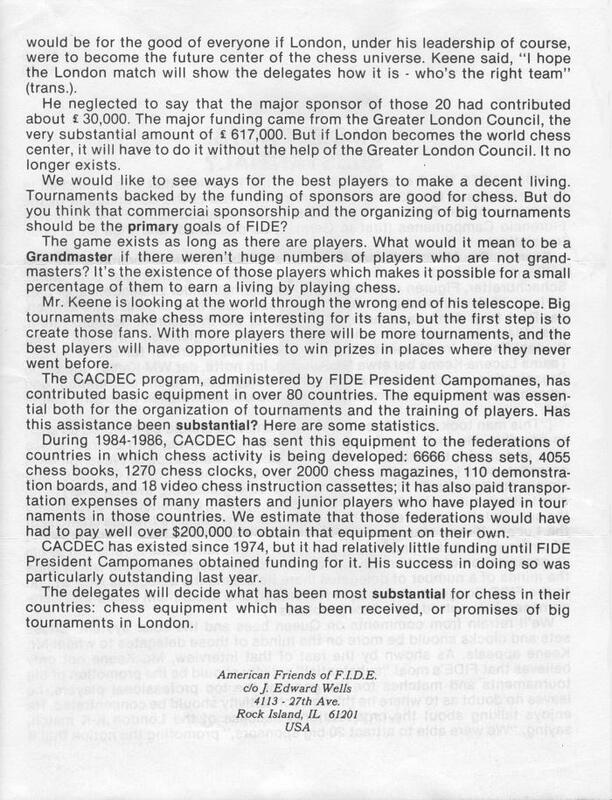 Yet the BCM had never mentioned or cited any of Mr Keene’s anti-FIDE vituperation (to which the Federation was reacting in the BCM reference). 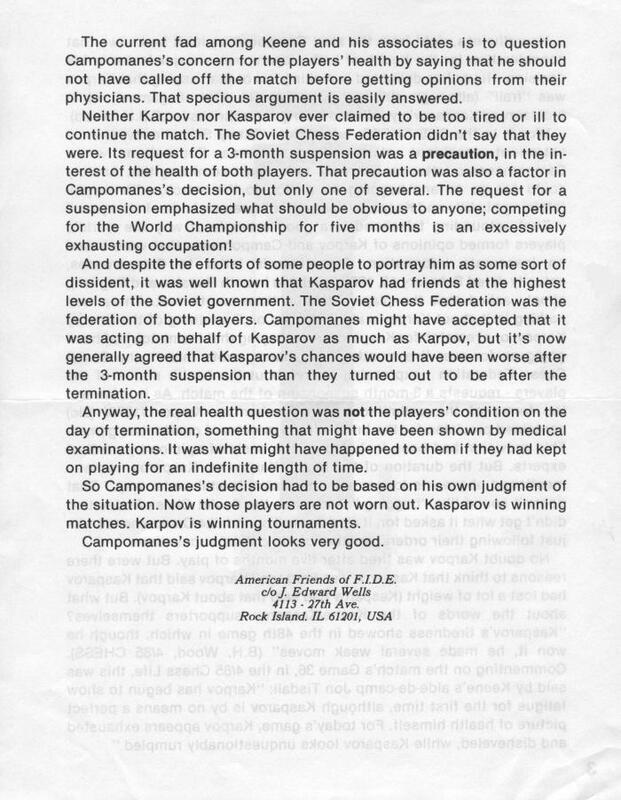 Nor has it done so since. 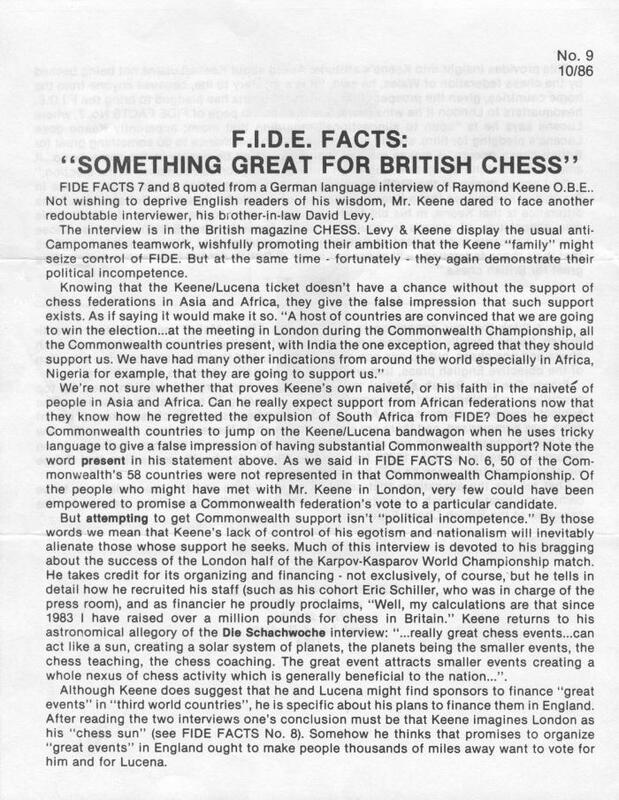 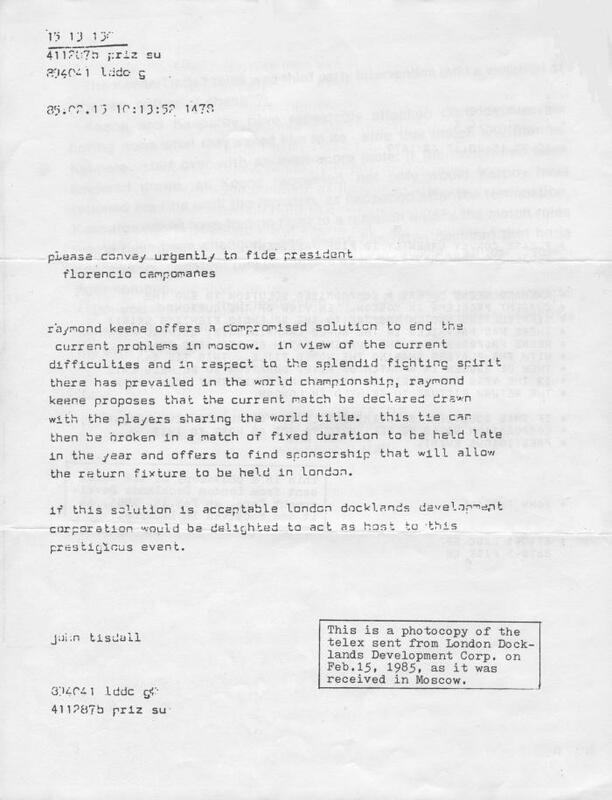 (An opportunity came when the front page of the Guardian of 6 August 1986 was bedecked with some cursing by Mr Keene, in an argument with FIDE about London and Swiss Bank Accounts.) 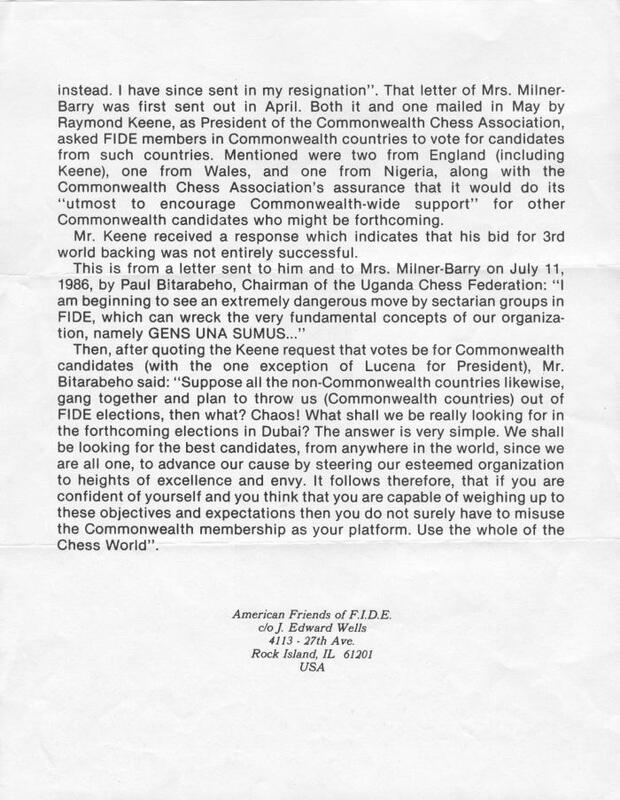 The false impression has thus been given that one side alone (the non-British, of course) has been guilty of verbal indignity. 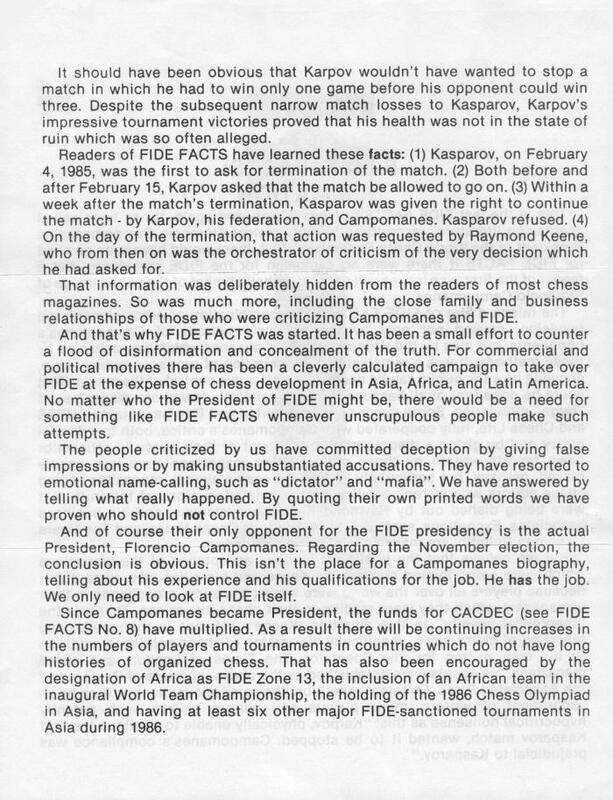 ... to which the BCM Editor adds the comment: ‘This is at odds with the statement quoted from the FIDE President, page 235 last month.’ In reality, it is at odds only with the misquotation of the statement by the BCM. 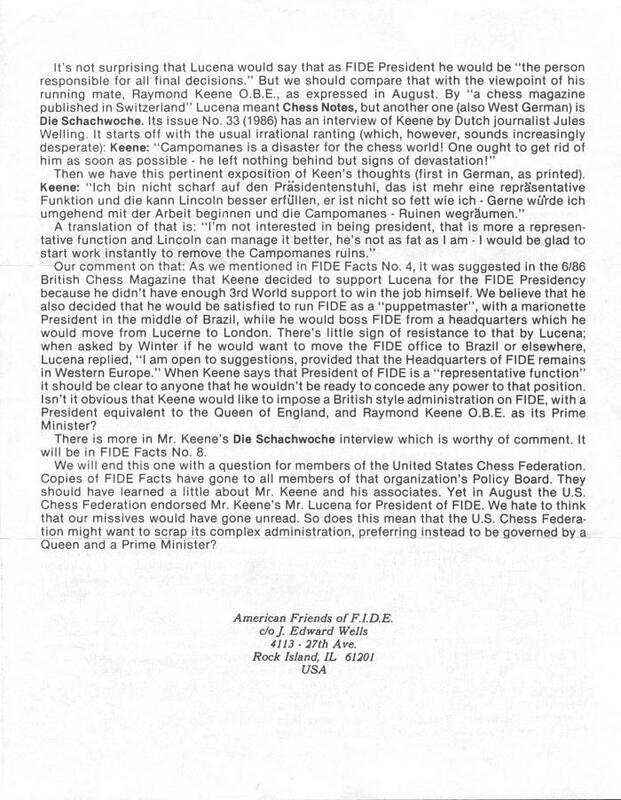 The magazine has yet to publish a correction. 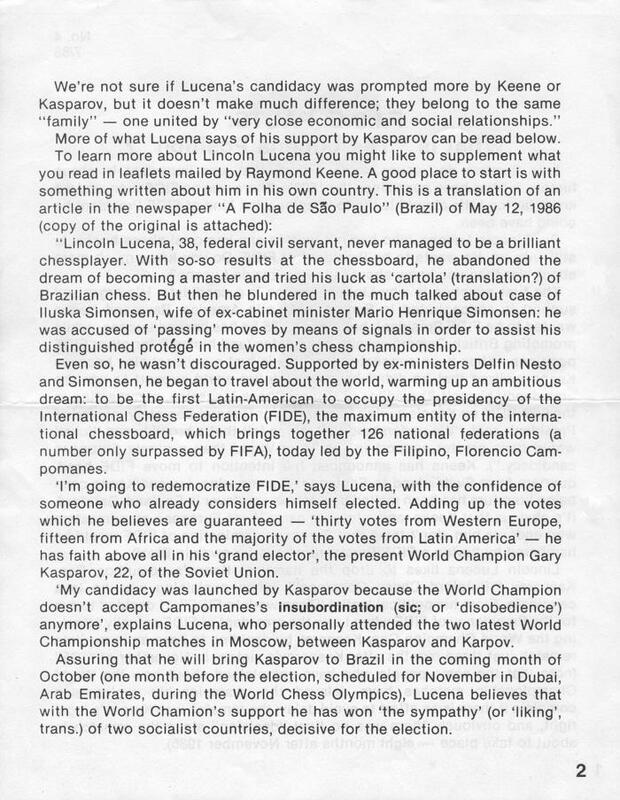 iv) Page 309, ‘The Things They Say ...’: an example of triviality and bias. 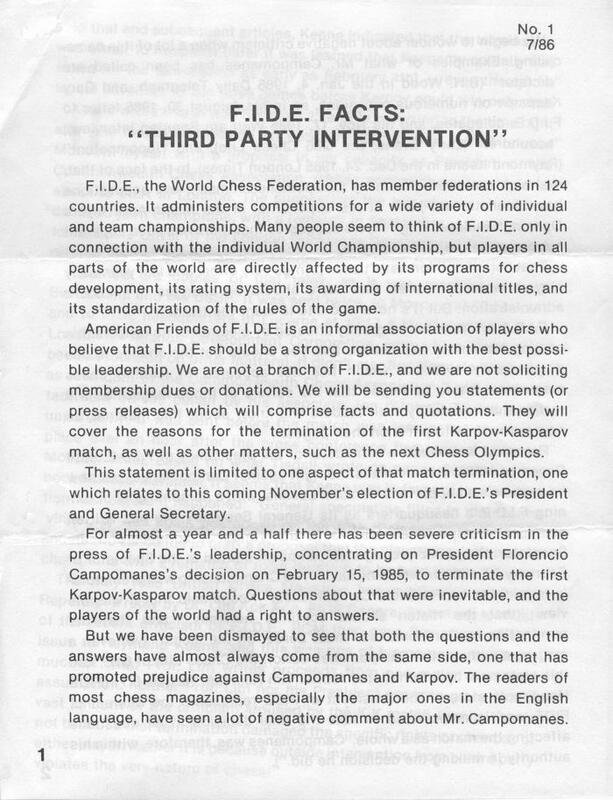 vi) As mentioned in C.N. 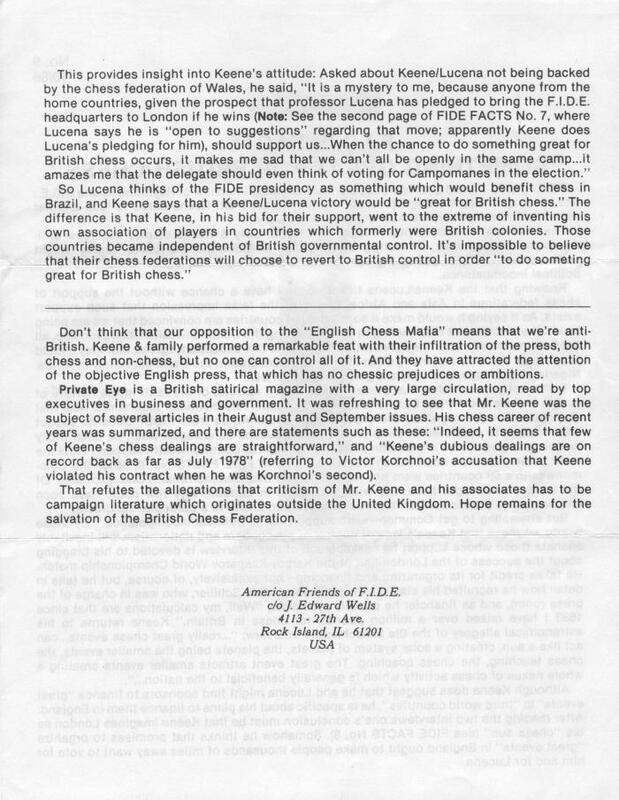 1245, Private Eye has been making a series of detailed accusations against Mr Keene. 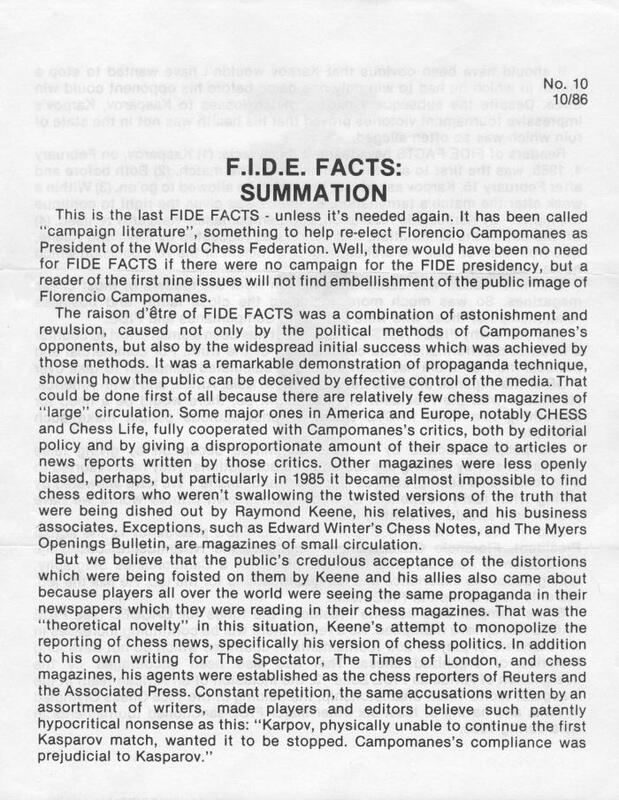 But a reader of the BCM would never know that; page 455 mentions Private Eye, but only to correct its confusion over the difference between the BCM and the BCF (admittedly a topical subject). 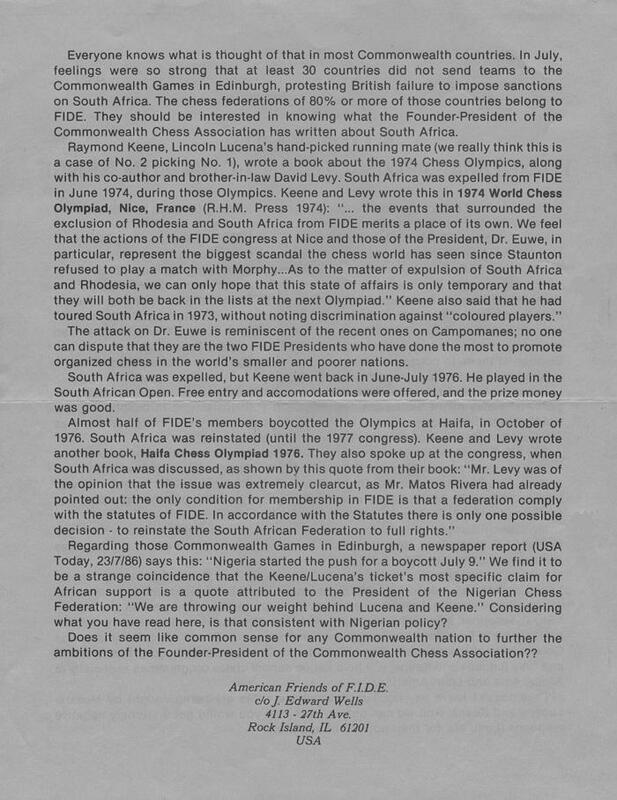 Where on earth is the logic in that second sentence? 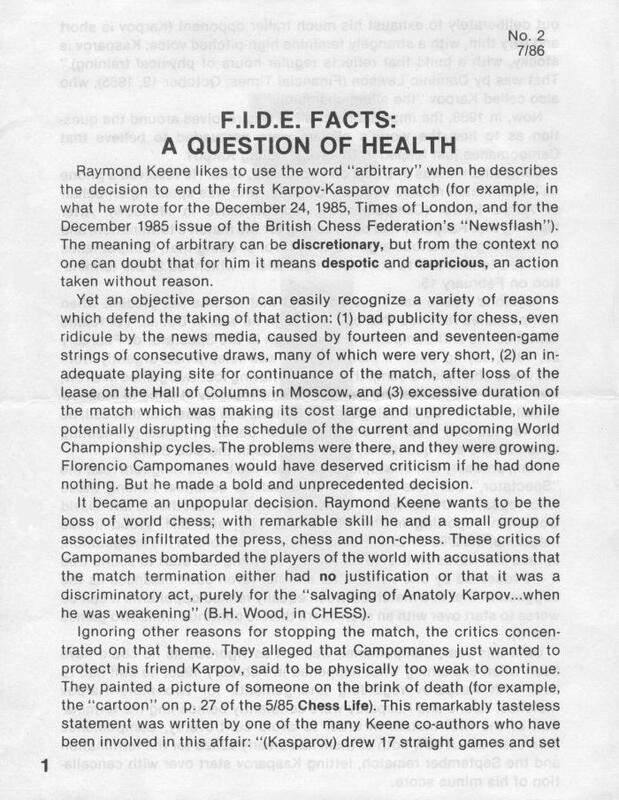 Truly this has been British chess journalism’s darkest hour. 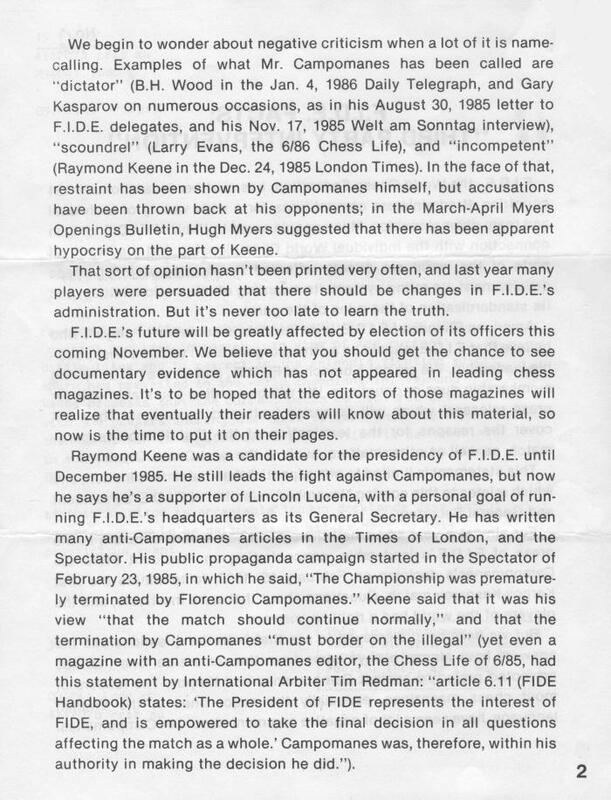 On page xviii of the Financial Times (Weekend FT), 6 December 1986 Dominic Lawson wrote an astoundingly biased account of the FIDE election which read as if dictated by Raymond Keene himself. 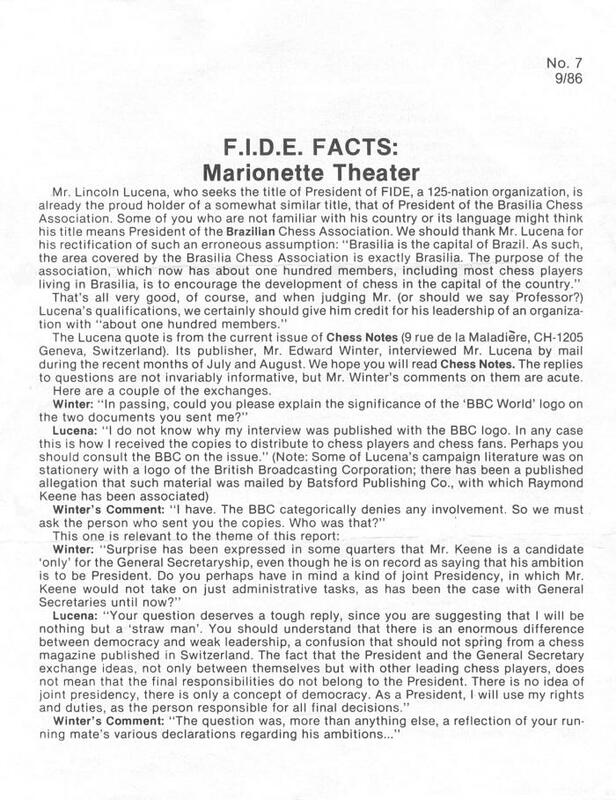 The BBC logo was also on the second page of the four-page document. 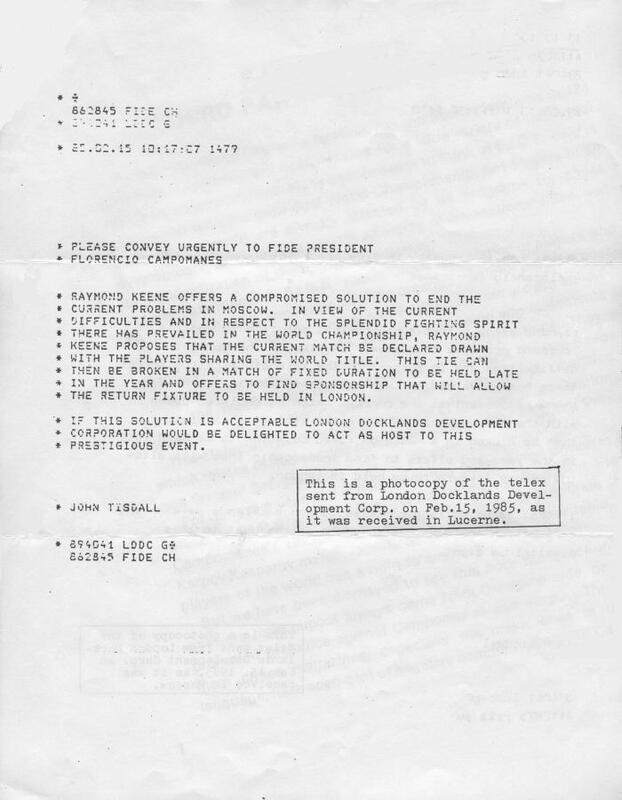 Latest update: 27 September 2018.